The Rotary Club of Windsor (1918) is celebrating its 100th anniversary in 2018. We’re planning a series of events throughout the year in honour of the occasion and would love for you to join us - Be a part of our next hundred years! In 2018, the members of the Rotary Club of Windsor (1918) will host a year-long celebration of the Club’s centennial. We are undertaking a large legacy project - The Rotary Club of Windsor (1918) Centennial Park - and are funding local community infrastructure projects, such as The Rotary Club of Windsor (1918) Centennial Hub, as our 100th-birthday gift to our community. 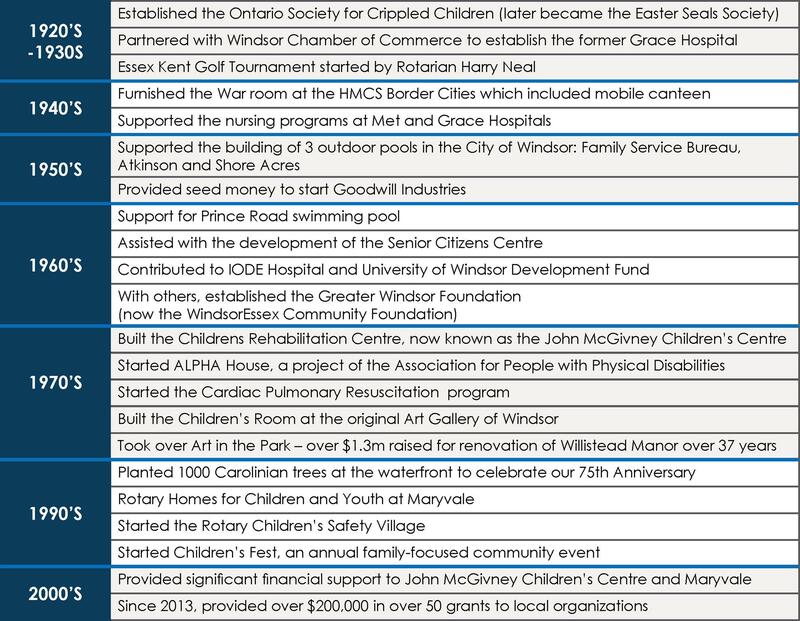 We will also host a series of events that will mark Rotary’s contribution to Windsor/Essex. Be sure to check out our Event Page, which will be updated throughout the year, and mark your calendars. We invite you to join us in this celebration, and to help us launch our second Century of Service! Rotary - the largest service organization in the world - was started in Chicago in 1905. Thirteen years later, The Rotary Club of Windsor (1918) was founded in Windsor. The Rotary Club of Windsor (1918) is the largest club in Rotary District 6400, which includes 40 clubs across Essex County and Southwestern Michigan. It is the "parent" of 4 other clubs in Windsor / Essex. Carry out humanitarian projects in the developing world, notably providing infrastructure in rural areas.